Floral gifts have been used to help express emotions and to convey messages for centuries. For both the recipient and the giver they can be extremely important. This is a fact that we at Beautiful Blooms take very seriously. Our policy is that if the gift is not 100% correct – it will not leave the shop. 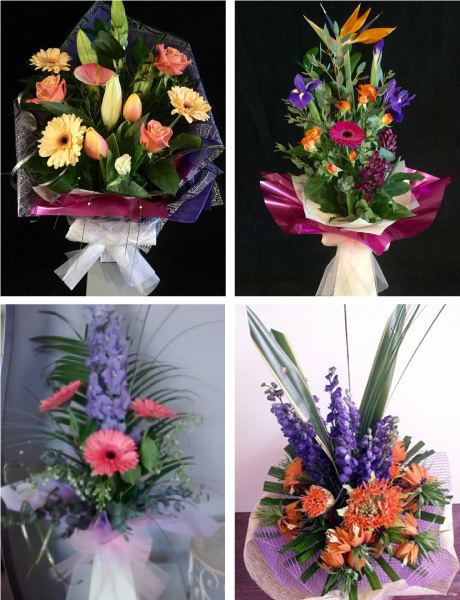 Most of our floral gifts are hand tied and ‘aqua packed’ which means that the recipient does not have to spend time re-arranging the flowers – in fact they do not even have to find a vase if they don’t want to. They are also very easy to transport if necessary. Of course, if you know the recipient would prefer to arrange their own flowers, we are happy to supply a gift wrapped bouquet of loose flowers. When you place an order with us you can rest assured that the item we produce for you will be unique. In this way, whatever we make for you is as individual as the message you wish to convey. For this reason, we do not operate a ‘menu’ type of ordering system, preferring instead to select and design according to the situation. Please see How To Order.